Upon reaching the flat tops, by summating one of the many mountains in this wild, vast expanse of hill terrain, the Spaniards made rest after they had periled through their long, arduous trek taken in the name of Imperial exploration. The soldiers were exhausted after climbing hilltop after hilltop, most likely done so in the blazing heat under a relentless sun. Los conquistadors felt ease, or rather a tremendous relief that they had conquered this mountain on foot and reached its top. They therefore, as the legend goes, turned to each other and said in their thick, Castilian Spanish – ‘gracias a Dios hemos llegada a tierra plana!’ the English translation of this being ‘thank God we have arrived at flat land!’ This event occurred way back in the 16th century. It was not long before more Spaniards arrived and the town of ‘Gracias’ or ‘Thanks’ was created upon the large area of flatland high up in the mountainous western highlands, as this geographical belt is known in Honduras. Honduras in fact, had not been kind to the Conquistadors. The name Honduras means ‘the depths’ for the Spanish sailors and Christopher Columbus christened it so, after their perilous voyage around the deep, dangerous coasts of the country’s north. Those waters were difficult to navigate and very dangerous for ships back then to pass through. Upon setting foot off the ships and onto the land itself, the Spanish military/explorers found the ‘natives’ to be somewhat disagreeable in that they didn’t particularly fancy invasion or worse still, being converted to Christianity. As if that all weren’t bad enough for the Spaniards, their biggest gripe was with the lack of natural ‘treasures’ – no gold, some silver but no ‘El Dorado’. Honduras had been a disappointment for these European invaders, especially all the more so after having crossed the entire breadth of the Atlantic Ocean to reach those ‘tropics’. I should say that it was not until I found myself in Gracias, that I realized or rather first experienced, what the quintessential Central American lifestyle is. If one seeks to find oneself in this part of the world, whereupon he or she desires the full, traditional and completely ‘stereotypical’ experience so characterized in books and films, then that person must by all means spend time in Gracias. Picture a place whereupon the warm, humidity, so typical of Honduras, cloaks itself upon the individual as he or she strolls through the maze of cobbled, colonial Spanish streets without much clear direction as to where anything is. The low rise, predominantly adobe buildings lye packed together in rows, their entrances guarded by the jolly faced yet beady eyed Mestizos, many of whom ‘vende’ or ‘sell’ clothes, souvenirs, foods, drinks and all kind of other items from within. The campesino on horseback gallops down these crowded streets by day, alongside the abundance of 4x4 vehicles with whom he competes for street space. Most walk however, these being mainly women and children to and from school, the markets or wherever they’re headed. Around every corner you turn, every bend you take, the sheer variety of shops on every street, from pharmacies and supermarkets, to enclosed market places and clothing stores, you will, as an outsider be forever intrigued. Schoolchildren chase each other, as old men sat on curbs watch and laugh. The indigenous women stay mostly by their stalls, greeting occasionally a fellow gentleman they know, most likely a campesino walking completely unmolested down a street with his arms length machete. Many a farmer carries his machete into town with him. There are indeed a lot of places within Gracias town selling all manner of cutting tools/instruments from machetes to flick knives, all of which can be purchased on the spot an for an insanely reasonable price. Gracias has everything from football and basketball courts to plush hotels nestled modestly somewhere within the maze street system. All streets eventually lead to the town center, yet the maze of cobbled stone streets and onrush of people make one lose his/her way almost constantly in trying to find the center. The Spanish influence on architecture for instance, is still completely evident, thus providing the backbone of what symbolizes Gracias. It is known as a place of much history. Commemorating their most famous of chapters is the large statue of Lempira stood within the beautiful square. The square or ‘el centro’ is where the town really comes alive at night and on their festivals. We arrived at a most perfect time, for the town was undergoing its annual ‘Lempira day’ to celebrate its great indigenous leader. The preparation takes weeks, for those involved, construct indigenous homes [casas indigenas] where on completion local dishes and brews are served within the wooden framed walls and its thatched roofs, serving as a reminder of what the indigenous peoples lived in. Lempira and his Lenca Indians, who once roamed the heavily forested mountains surrounding Gracias, now come to life once a year in the guise of schoolchildren dressed up. Military aircraft flies overhead on this day, as hundreds gather by the square to watch dressed up men [representing Conquistadors] fight the children, or the ‘Indians’. A band of musicians play Latin music from the great stage, which enters itself into the many cafes/restaurants as the celebratory noise pounds every wall in Gracias. El centro is truly lovely, people of all ages would come every evening to just sit, walk, talk and socialize. People sit on all the benches, on all the curbs and anywhere remotely possible. Hondurans like to sit, especially the men, watching the world go by and people watching are something of a national pastime. There is a small, tower like building smack bang in the middle, which happens to be a very artistic coffee place, serving all kinds of pricey hot beverages and puddings. I enjoyed many a good evening sat up on the tower top balcony, un cafésito en mi mano whilst watching the square live its fascinating little life. The square is lined with planted trees, all of them quite unnoticed due to the many important buildings in the vicinity. The grand church of Gracias lies directly behind Lempira’s statue, whereas to the south of the stone Indian chief, is the Mayor’s building. There exists a nice little Honduran fast-food restaurant at the front of his building. Gracias, apart from the Amerindian warrior Lempira, is probably most well known for Las Aguas Termales or ‘The Thermal Waters’. They are utterly marvelous. I can barely describe the wonderful feeling of relaxing into these hot waters, a natural marvel created by nature, yet utilized and transformed by man into a pool complex with changing facilities, music and traditional Honduran restaurant/bar on site. After about a 10 minutes drive away from Gracias town, heading along the main road and then into small back lanes within the hill country, one reaches this natural treasure. Just like the town square, everyone goes. Families, old people, teenagers, tourists – it is a lovely place. Nestled within the green hills, these thermal waters are centuries old produced by some kind of geological science that I’m sure I wouldn’t understand even remotely. At night, the aguas are at their finest, lit up by romantic, faint lighting, the stonemasonry from which the pools have been constructed glow a glistening color as the dark blue water glimmers in the heat of the Honduran night. People sit, talk and relax amongst themselves without a care in the world. I would recline in the quiet pool, sipping Ice Tea or ‘Salva Vida’ – the Honduran national beer. On the outskirts of Gracias as well is the Old Spanish fort, which sits on top of a large hill. I found this to be a very interesting place and its whitewashed, classically Spanish architecture most attractive. From the fort one can oversee Gracias town below and also witness the magnitude of hills and mountains in the distance. The fort was built by Los Conquistadors to guard the town and defend it from Guerreros Indios up in the hills. 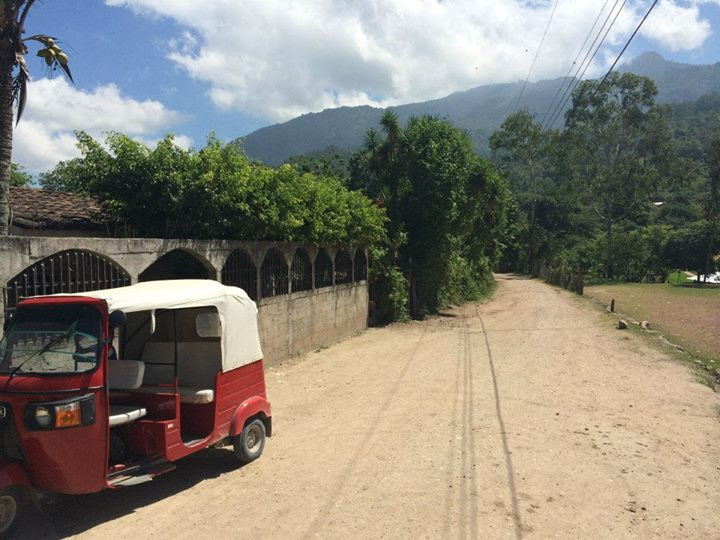 Another interesting thing of note is the most common form of public transport in this part of Honduras. Gracias, and its surrounding area, are home to the amusing little ‘toot’ toot’ cabs as we [my co volunteers and I] named them. Hard to describe unless one is familiar with these, the ‘toot’ toot’ taxis operate all over the area, taking passengers almost anywhere depending on how much dinero you’re packin’. For the right price, and let me just say one has to haggle with each and every driver for there is no set price, you can be taken many places. Equipped with two back wheels and then a third, lone front wheel, the open doors [or rather door-less] taxi has a tiny three persons max seat making these vehicles a cramped, clustered and horrendously bumpy ride. With their radio sets bumping Latin music full blast, some drivers make conversation whilst others just sit there in silence driving along smiling at you through the mirror occasionally. It is a great way to travel, especially at night going through the deserted hill roads back into town with a crazy Colombian driver pounding Reggaeton and offering maryjane. One must of course, refuse the latter as I respectfully did. 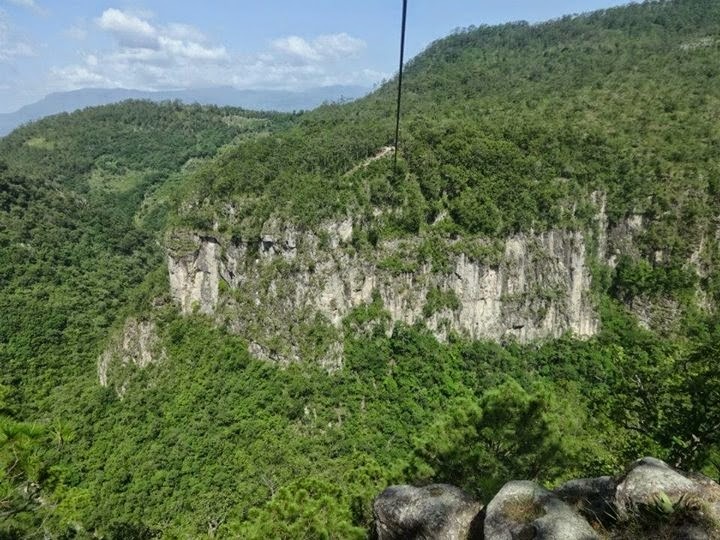 Gracias, Lempira, is a true gem, an unknown Central American destination to the outside world, which is undoubtedly the reason for it’s old fashioned, untouched and traditional atmosphere. 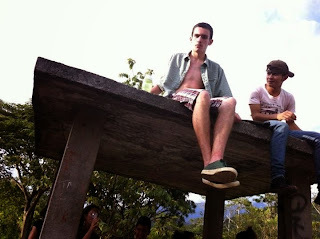 I do not wish any form of ‘westernization’ upon the town - I do not furthermore wish any upon Honduras. I of course, do not exclude necessary change such as better medical access – something the western world succeeds better at. I simply pray that the Honduran generations to come preserve their country as it is, solely improving what needs doing so. There is an ambience so laid back, a feeling so calm and a people so amiable within this place that the notion of change brings an uneasy, upsetting thought, for I sincerely hope Gracias remains itself. 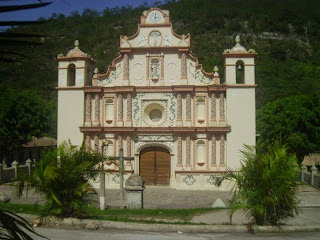 That is, a town rich in history, culture, natural beauty and all that represents the true Honduran spirit. Personally, I enjoyed the ‘alien’ feeling of content day after day whilst living my three months there, for this feeling is something that I have completely inexperienced in England - hence my describing it as ‘alien’. My memories of Gracias shall continue to thrive para siempre. Photos: credits go to Emma Hooper, Philip Sparks and Sam Lax, ex co-volunteers in Honduras. I appreciate this so much Ben, come back to visit us soon! Don´t forget the gifiti, jeje! Take care buddy, you know you have good friends here. Gracias Francisco, glad you enjoyed it mi bien amigo, you bet I'll bring the gifiti y el ron Cubano - vamos a la playa! Take care my dear friend.